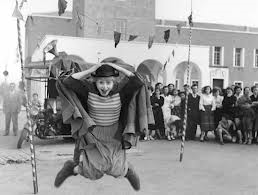 La Strada is one of the masterpieces by the Italian director Federico Fellini. “La Strada” which literally means “the road” is the setting of a story that finds humility in the most wretched of situation. And a love story that is not conventionally rosy, or even conventional for that matter. The hero Zampano, is macho and brave but far from virtuous, and he is pitted against an antagonist, Il Matto, literally the fool, who is far from sinister, and is in fact endearing and kind, whose only “flaw” is the impish naughtiness. Anyway, Zampano is as far from the Platonic hero as could be, and yet there is a goodness in him, a nobility, that was perhaps robbed by time, and the society. Zampano’s love interest Gelsomina, is not beautiful or charming, neither is she a resolute heroine. Yet these characters lives are weaved together in ways that are most beautiful and tragic at once. The allusions that Fellini draws between his characters and the erstwhile society they inhabit are very exact. He is not scared to explore the dark alleys of the society, as well as that of the mind. Yet he does not make them Beckettian, there is humour, music, along with the desperation and violence in Fellini’s world. And there is melancholy and pathos too. Zampano, the travelling braveman arrives at Gelsomina’s home and literally buys her. There are few things here that might go unnoticed as we are just being introduced to the film. We are assuming that since Gelsomina’s sister has died, he has come back, for perhaps a wife. Yet it is never answered throughout the movie what happened to Gelsomina’s sister, Rosa, casting doubt, on a subconscious level, about Zampano’s character. He certainly did not come looking for a mistress for we find out that really isn’t a task for philanderous Zampano. And if he did come for a mistress he should have changed his mind and left after seeing Gelsomina. There is a steely resolve in him coming and taking her away. Personally, I do not think I have ever seen a female protagonist, like Gelsomina, anywhere ever. Sure, she comes from the lower classes of the society, so she would be far from refined, yet the talent of Giulietta Masina, makes this act a sublime play of what wretchedness and poverty can do to a woman’s sexuality. Even the gentlest soul of Il Matto is a little amused at Gelsomina’s, appearance, making her doubt her own womanhood. But the tools that Fellini is using, of setting feminine awkwardness in a Chaplinesque frame is pure genius. And yet Zampano does not seem to mind. In a way Zampano’s affection towards Gelsomina is fatherly at times, for instance, when he finds out that she cannot cook or dance (or be anything at all). He still doesn’t leave her. He is amused in the things that she does, that may otherwise seem juvenile. And for her he is the hero, who rescued her from her deadend life and took her on an adventure. And as we soon see, Gelsomina, is capable of every emotion that a woman feels, despite her inability to have completely grown into womanhood. Although, she herself never says this, her emotions are voiced by Il Matto, who assures her that her purpose in life is to be with someone like Zampano. That is the reason she has a breakdown when she sees the fall of her hero, who can go to any end, when provoked, who could even murder. It is a loss of faith. In the end, for Zampano, Gelsomina becomes the classical a musk deer who does not know that the maddening fragrance comes from within, not knowing that he loved her all along. Fellini has set a tough turf in telling this story of people who do not matter to society. The war torn Italian society must have created many such Zampanos and Gelsominas, and it had made an impact on Fellini, such people in his society, and as a class filmmaker he tells a story that otherwise would have remained untold. 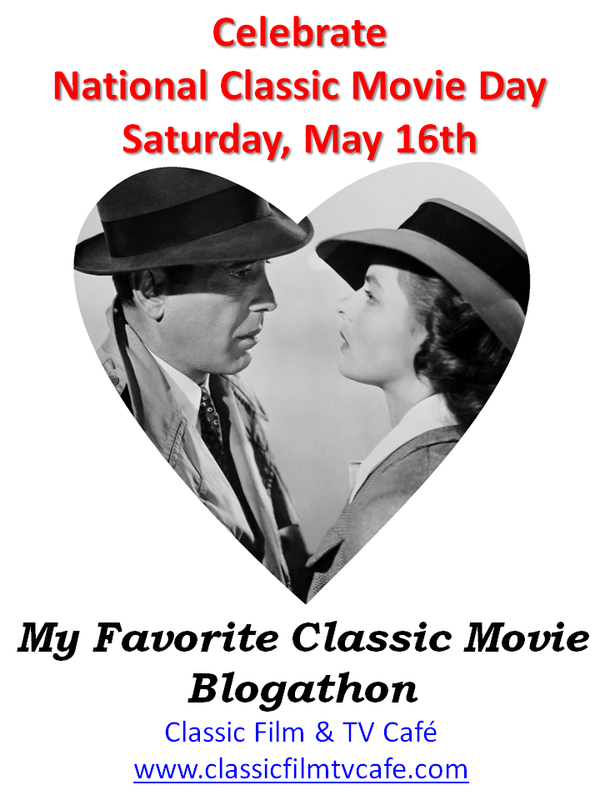 This post is part of the My Favorite Classic Movie Blogathon in celebration of National Classic Movie Day (May 16th). Click here to view the schedule listing all the great posts in this blogathon. Thank you Team Classic Film and Television Cafe, I enjoyed writing it! 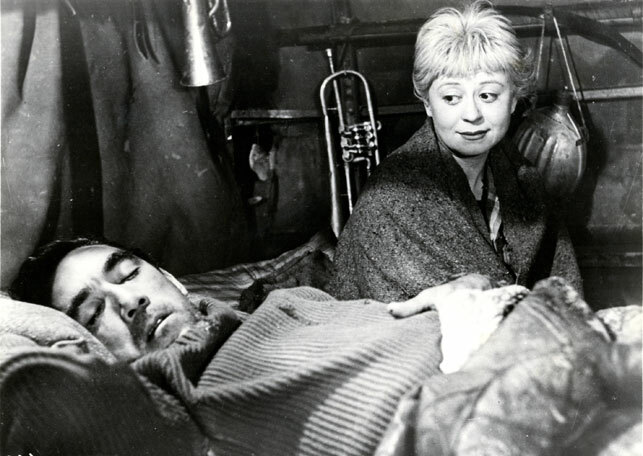 The music and the heartbreak never leave you after you’ve seen “La Strada”. Could not agree more! More than 10 years, very few movies have remained with me this way! Thanks! It has been awhile since I’ve seen this, but I believe this was my first Fellini. Masina’s performance still sticks with me. Great review. I’m due to revisit this one soon. I’m hoping for that Criterion Blu-Ray upgrade soon. I hope you do. Your project is interesting too. Wish you luck! 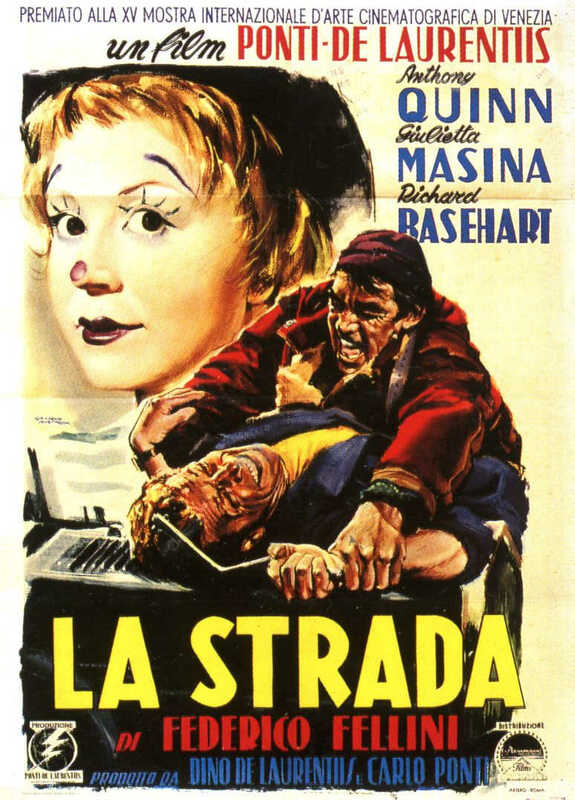 I believe LA STRADA was my first Fellini film, too. Although all three leads are excellent, the film belongs to Giulietta Masina, who draws in the viewers here as she did in the equally wonderful NIGHTS OF CABIRIA. It is indeed a Chaplinesque performance, but there are few actresses capable of portraying so many emotions simply with their facial expressions. Yes Masina really added so many shades to the character, in this movie and Nights of Cabiria too. She complemented Fellini’s talent so well. Thanks for hosting this blogathon, I loved writing for it!!! I’m not sure why I’ve never got round to watching this! Fellini really has a talent for sharing and telling those ‘overlooked’ stories, it’s – for me – the key component that makes him a great filmmaker. Will come back and re-read your review once I’ve seen it! Oh yes, you should absolutely watch it! It is the kind of film that stays with you forever. And both, Masina and Anthony Quinn have added so much of their own to this wonderful love story! Hope you get to watch the movie soon!